While moving homes is an overwhelming process, relocating office space is even more so. For one thing, there’s more to pack up. Chairs, files, supplies, and desks all need to be transported from one office to the other. Additionally, you have employees to organize and resettle. So how can you make your office relocation as stress-free as possible? Here are some tips from Junk360 to make this transition seamless and easy! What furniture will you keep? What office supplies need replacing? Where will this item fit into the new office layout? Be sure to identify which office supplies need to be updated. Knowing what equipment is junk will help you optimize your office relocation! Touring the Office Space: Having an understanding of the new office layout allows you to figure out where items will go in advance. This ensures that office supplies can be placed exactly where they need to be instead of organized again after unloading. Pack and Label: Every piece of office supplies should be packed and labeled with what it is and where it belongs in the new space. Be sure to visually identify which supplies you’ll need immediate access to. Set Aside Junk and Donations: Designate a space in your old office for placing items you plan on getting rid of or donating. This will keep unnecessary items out of your way. Relocating office space is also a great time to organize and update your filing system. Make sure you create a separate box for documents that need immediate attention. 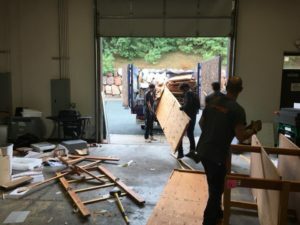 Once your employees and supplies have relocated to your new office space, hire a junk removal team to clean out what’s left. When you’re ready to pack up the junk, hiring the right people to get the job done means that you will be able to focus on the things that matter most. Have a Stress-Free Office Relocation With Junk360! Don’t stress over junk disposal after your office relocation! 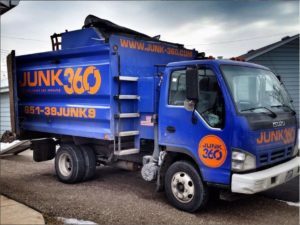 At Junk360, we offer a safe, efficient, and eco-friendly junk removal services for businesses, so your team can focus on what really matters. Plus, we’re an eco-friendly organization and will recycle and donate as much of the material is possible! Call our professional crew today at (651) 395-8659 or request a free estimate online. You can trust our Junk360 team to take the stress out of your next office move!